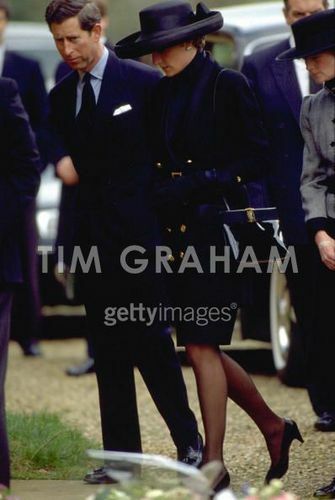 Diana At A Funeral. The Prince and Princess of Wales arrive at Great Brington Church for the funeral of her father, Earl Spencer, March 1992. Diana's sister Sarah McCorquodale is on the right.01 Mar 1992. Wallpaper and background images in the राजकुमारी डाइना club tagged: princess of wales. This राजकुमारी डाइना photo contains ग्रीन टोपी, विशेष बलों, कुलीन सैनिक, हरे भरे, विशेष बल, हरी टोपी, अभिजात वर्ग सैनिक, वरदी, रेजीमेंटल्स, regimentals, पूरी पोशाक वर्दी, and पूर्ण पोशाक वर्दी. There might also be पोशाक उदास, पोशाक गोरों, ड्रेस ब्लूज़, ड्रेस सफेद, उदास पोशाक, सफेद पोशाक, राइफल करनेवाला, राइफलमेन, रायफलमैन, and बिजनेस सूट.